They will soon be waving Mexican flags, burning American flags and blocking traffic. It'll be interesting to see how opinion polls change in the coming weeks. Our laws mean nothing to these people. They will soon be waving Mexican flags, burning American flags and blocking traffic. They already do all of that. It'll be interesting to see how opinion polls change in the coming weeks. Yes, it will, now that a debate over DACA has drawn attention to these types of antics. As grating as they are, I wish people would actually pay attention to what they're saying and what their signs read. (Well, when it's in English anyway). They're demanding amnesty for their entire families of course but also all illegals already in the country! They are a giant Trojan Horse of foreign invasion. Why do you xenophobes always try to paint all people in your target group (illegals) with a single stroke of the tar brush ? Do you really think that most of the 10 million or so illegals think that anyone at anytime should be able to come to the US and be naturalized ? Have you ever tried to actually have a conversation with any of them or would that be too upsetting to your critical stereotypes ? Do all Muslims also support Sharia in the US ? Seriously, if one feels strongly about this issue as many do, you owe it to yourself to understand the details along with the people affected by them so you can at least add something to the overall discussion - something besides hurling dirt. Do you really think that most of the 10 million or so illegals think that anyone at anytime should be able to come to the US and be naturalized ? No, not anyone anytime but many want their whole families to be able to come, so millions of illegals wanting THEIR whole families to come, could mean hundreds of millions more, we have a system, they need to follow it like everyone else had to. Yes I had spoken to many ILLEGAL aliens during the course of my jobs, most wanted their families to be able to come here, as do LEGAL aliens, the difference is that LEGAL aliens, such as my wife, came here the right way. ILLEGAL aliens equal an invasion of our country, by those who do not belong, have not paid the fees, have not stood in queue like LEGAL aliens had to, have not had the medicals or background checks that legal aliens have to have, etc, etc. All illegal aliens need to go home and use what they have learned for free in our country, to make their own countries great, for their own fellow citizens so they too will have a better life, instead of taking our citizens jobs and overloading our system, and if they want to live here, then go home and file the papers to come back in legally, surely they could have saved up the money to file the proper paperwork and arranged whatever might be necessary to get those papers approved. They stormed the offices because they have seen that being loud and disruptive in America you get noticed. Think Black Lives Matter when they were trashing the place. I would like to see these illegal bozos go back to their country or any other beyond America or Europe and see how they would be treated if they tried this stunt there. This so called protest of storming the offices and neighborhoods of the elected sounds like a good opportunity for ICE to start rounding people up. 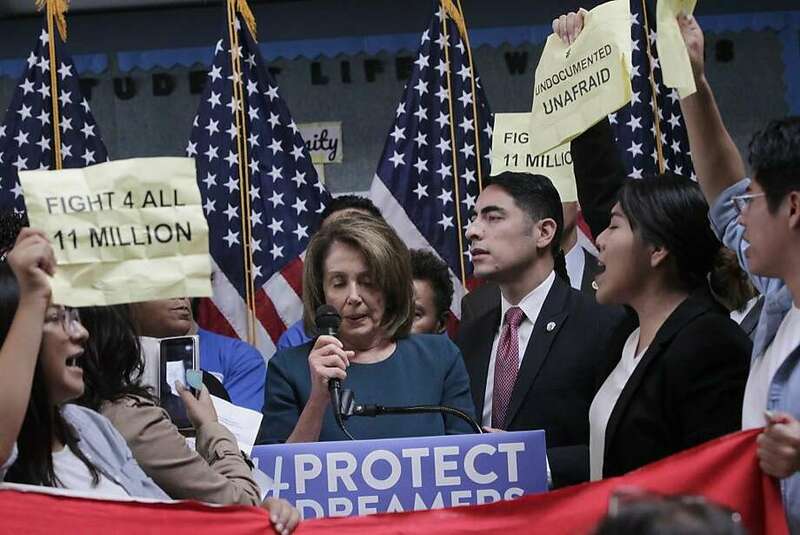 They want amnesty for "ALL 11 MILLION," not just 700,000 DACAs. A xenophobe has a fear of strangers. We already have people from all over the world living here legally or are citizens of our country, so where is this xenophobia? The point is that illegal aliens are all here in violation of our immigration laws and should be deported. Sorry, I don't hang out with any of them and I really don't care what their thoughts are. Their thoughts are irrelevant to our laws.